"I highly recommend�Primo Music�to Local Mums. The classes are fun for the kids and for the adults and Charlotte changes the class every week so they remain fun and interesting. You can tell that so much care and attention goes into planning the class so that children of different ages can enjoy and take part and so the children can build on what they have learned. The songs are catchy and focus on things that your child will come across on a regular basis so you find your child singing the songs throughout the day, such as when it rains "rain is falling down", or when they see the postman "Here comes the postman." 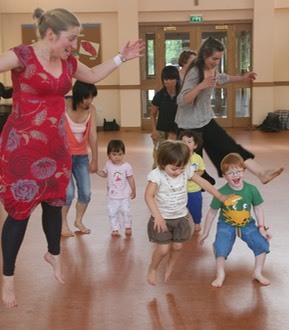 The classes are very relaxed and not intimidating at all for the kids or the adults." 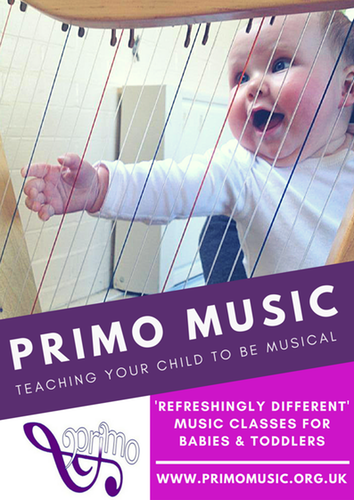 "I recommend Primo Music�to all Local Mums.�I have been loving my children's Monday afternoon music classes with the wonderful Charlotte aka Primo Music. William is three and a half and Eleanor only turned two at the beginning of July. They love the class, practise all the songs at home and in the car (though still a bit reticent about singing out in class) and are developing musical awareness so naturally that I would very soon be envious, except that I am learning with them. Charlotte's early years teaching is the perfect springboard for more formal musical learning and I couldn't recommend it more highly. Anyone with �children, grandchildren, nieces/nephews aged 0-8 should give it a try." 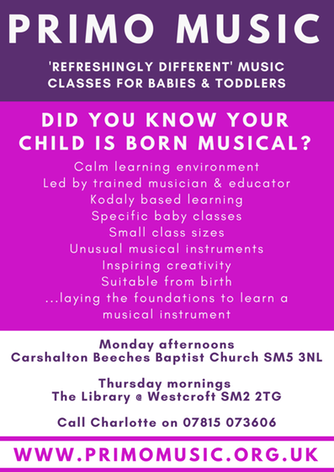 Every child is born musical.�Primo Music, an independent music practice for children from birth to eight years, will help support this musicality. Based on the foundations laid by Kod�ly and Jaques-Dalcroze,�Primo Music�has been created to inspire musical creativity in the very young. Devised and taught by Charlotte Gibbs, the ongoing curriculum will lead to a life-long love of music and will provide a sound basis for instrumental study. You can expect small class sizes, a calm learning environment, and carefully chosen material to help your child learn the foundations of music. We do lots of singing to engage our inner hearing, learn to convey the length of musical sounds in rhythm language and we sing in solfa to help with hearing intervals and singing in tune. We also play unusual world instruments, which the children would not normally encounter. For our new babies, mention this advert for a Local Mums Discount!